One of the largest Night Entertainment group in Indonesia is planning to create an international scale integrated entertainment venues. For the construction, they require noise control consultants. In the end, they chose us. 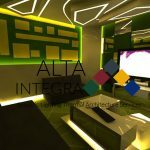 The period of October 2012, we (Integra ALTA team) became a consultant noise control plan to build the club and restaurant called Exodus. The Exodus Club is located in Jakarta, Jl. Prof. Dr. Satrio (Casablanca) Plot 18. Kuningan City Mall floors five, six, and seven. The fifth floor is the placement for the club, the sixth floor is the placement for the restaurant that features live music with a jazzy touch, and the seventh floor will be used as fine dining. We start from the concept design to manufacture appointed a consultant noise control. In order to save costs for consulting services noise control, Exodus Club Jakarta just asked us to handle soundproofing on floors five and six due to vote on the seventh floor was not too loud sounds outside. Goal noise control consultant at Exodus Club Jakarta is installing soundproofing so that the sound does not leak out and not disturb the surrounding area, for example in the apartment, a cinema, or the mall area. 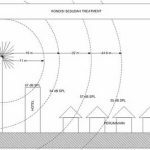 The initial measurement is performed to determine the level of sound leakage in the area of apartments, cinemas, and the surrounding settlements. Our measurements done by turning the sound system speaker on brand Function One sound pressure level of certain commonly desired by diners club. From the measurement results, we can identify the level of leakage at locations around and track the propagation of sound leakage. After learning the results of these measurements, we can calculate the value of transmission loss soundproofing required. After the calculations of the need soundproofing / noise control in the room, then we can create the working scheme for installation. Di bawah ini adalah gambar rancangan soundproofing pada dinding lantai lima. Below is a picture of the design of soundproofing on the walls of the sixth floor. 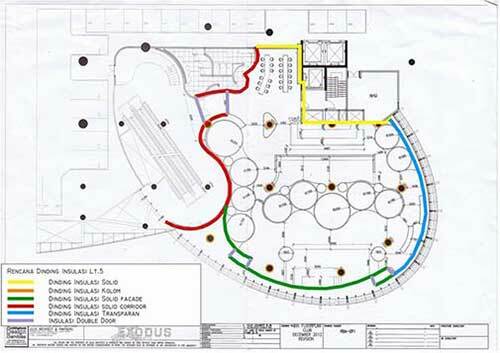 Supervision of the work we do to make the implementation work of the contractor in Exodus Club Jakarta can be run in accordance with design drawings ALTA noise control consultants Integra. After doing the working methods, we can conclude that the noise is heard on the sixth floor and seven occurred due to propagation of vibration and HVAC leaks. Noise is heard in the outdoor and pool caused by the propagation of vibration. Then, the noise is audible in mega brass housing caused by flanking glass. Approximately nearly about a year we constantly monitor the progress of development Exodus Club Jakarta. Work completed by the end of July 2013. Concerns about sound leakage does not occur in Exodus Club Jakarta. Usually it is the problems that often occur in places of entertainment are located in public areas or public. Installation of soundproofing can walk ideal and indeed a very important role to overcome the problems of sound leakage. 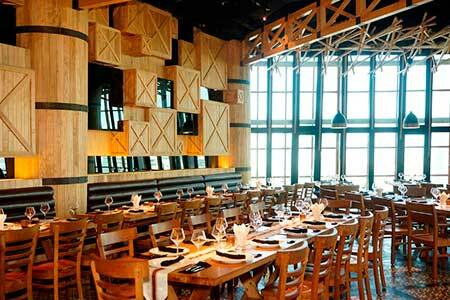 After construction is completed, clubs and restaurants can be enjoyed by all visitors comfortably. Outside area nearby is also not bothered by the noise of the Exodus Club Jakarta. Exodus owner satisfaction in the performance of consultants Integra ALTA noise control for the achievement of original expectations. A voice from the inside does not leak out and not disturb the surrounding area.